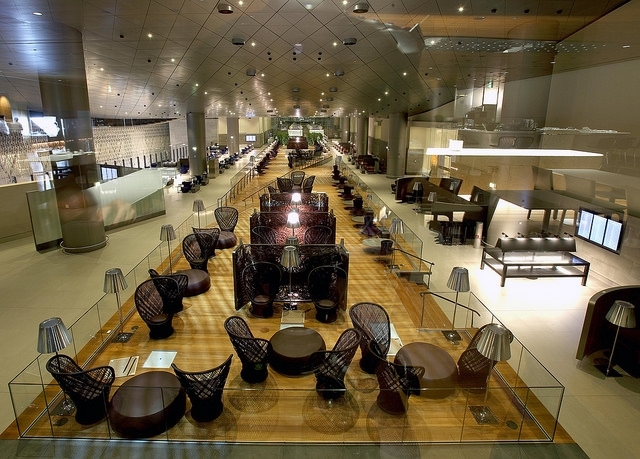 This review looks at the Qatar Airways Al Mourjan business class lounge in Doha. I was on my way back to the UK, flying Qatar Airways’ business class product for the first time. The review of my Qatar Airways Bali to Doha Boeing 777-300ER flight is here. I had landed at Hamad International Airport, Doha with a three hour stopover before my next flight. Normally I would be unimpressed at the prospect of such a wait but as this gave me the chance to experience Qatar’s flagship business lounge – the Al Mourjan lounge – I was intrigued. I’d never been to Hamad International Airport before and was facing sensory overload before I got anywhere near the lounge. It seemed enormous and lavish. Huge video screens and gigantic modern art were everywhere. An animatronic Tyrannosaurus Rex snarled at me (for sale at a mere $5,000) and a massive and imposing hungover looking Pudsey Bear stared down at me and many other stunned passengers. Some of the most wonderful and surreal looking children’s play areas I’ve ever seen were scattered around the building too. This was all somewhat unexpected but I thought boded well for my lounge visit. It didn’t take long to find as the airport signage was good. It is located on the third floor of the Duty Free Plaza South. A quick glance at my boarding card by a staff member allowed me onto a dedicated escalator which took me up to the reception. The lounge accepts Qatar Airways and oneworld First and Business Class passengers, although there is also an amazing First Class lounge too which Rob reviewed here. If you are flying Qatar Airways in Economy – no codeshares, no partner airlines, no frequent flyer miles redemptions – you can also purchase access to the lounge. Prices vary online but it looks to be in the £75-100 region, so far from cheap. The entrance reception had a simple design with a long desk. …. and was very suddenly overwhelmed. The lounge is cavernous. It is marketed as being the size of ten Olympic size swimming pools, around ten thousand square metres! I couldn’t make out where it finished in one direction. I must have looked lost whilst I stood staring around as I was approached by a staff member. He turned out to be very helpful indeed as he pointed me towards a locker room where I could leave my hand luggage. I may well have missed this useful facility otherwise. It is situated very close to the right of the entrance but is a fairly innocuous doorway. At the locker you just create a pin code and can safely store your bag until you needed it again. Just around the corner from the locker room I discovered a space which contained many private areas with loungers for those that wanted to have a lie down. Heading back to the main part, I decided to walk around and get a feel for the place. Clearly much thought had gone into the design. It had the feel of a classy hotel and the ambience was pleasant in parts. But some parts also felt quite sterile, particularly where the ceiling was high. This reminded me that I was still in an airport – quite frustrating as one of the functions of a lounge for me is to escape that fact. There were ultra-modern designer chairs that came with a touch screen information station. I never got around to seeing what these screens could actually do and I didn’t see anyone actively interacting with one. There were private clusters of single seats surrounded by birds nest like partition furnishings. There were low seats you struggled to get out of and high chairs alongside breakfast bars and lots in between. Many but not all had universal charging points close by. The lighting was also varied and this created a tangible difference between certain areas, changing the mood which in turn drew me to a particular spot. As it was midnight I couldn’t ascertain the level of natural light but judging by the amount of glass everywhere I suspect some enters in during the daytime. There was even some greenery at the far end which is always nice to see. It was a random but welcome sight to see some living plants which formed a short walkway onto an elevated central section with more seating. On the opposite side to the entrance, the lounge branches off from the main area. Here can be found further quiet seating. On the left is a children’s entertainment room housing several Sony Playstation and Nintendo consoles, a table football game and a replica Formula One car racing game. Also down this side is the business centre. This was by far the most impressive business centre I’ve ever seen in a lounge. There were numerous private work stations as well as open tables with computers and printers. Newspapers were available at several tables located throughout the lounge. This included The Guardian, The Financial Times and i. There were also French, German, US and Arabic papers available. The magazine choices were very disappointing. I only saw two Qatar publications – their inflight and shopping magazines plus the official Fifa magazine ‘Fifa 1904’. Wifi was available throughout but I struggled to connect to it. After three or four attempts I considered trying the free airport wifi network which was also picked up on my phone but eventually managed to connect to the lounge network. Once connected, the wifi was fine for normal surfing. Continuing the theme on the Qatar flight, Rituals products were present by both the shower and sink basin. The shower had the very pleasant Hammam range. The shower was powerful and combined with the Rituals products afforded me a welcome and invigorating freshen up after my long flight. There was little chance of leaving this lounge hungry or thirsty. Soft drink stations were located regularly throughout. Soft drinks available included the usual candidates of Coke, Sprite, Fanta and Ginger Ale. Some (but not all) of these drinks counters had hot drink machines on them. There was a choice of six Dilmah teas and various coffee iterations. There was also at least one standalone more serious coffee maker. The cafe had a nice ambience with touches of flair in the lighting and elevated dining tables. It looked about half full when I sat down. The service counter had a tempting display of fresh bread at the back. There were small mezze dishes, quinoa / pasta / potato salad bowls and two soups (leek and potato and Mediterranean fish) available here, both self service. Hot, cold and a small selection of alcoholic drinks were also offered. The table menu consisted of freshly made to order sandwiches. Choices included cajun chicken in ciabatta, Norwegian smoked salmon, deli lamb and veggie extreme. I ordered the roast beef in rye loaf sandwich which the waiter brought over in no time. The photo doesn’t do it justice but it was really delicious – warm, crisp and fresh, just right as a midnight snack! The restaurant on the above mezzanine floor offered something more substantial. 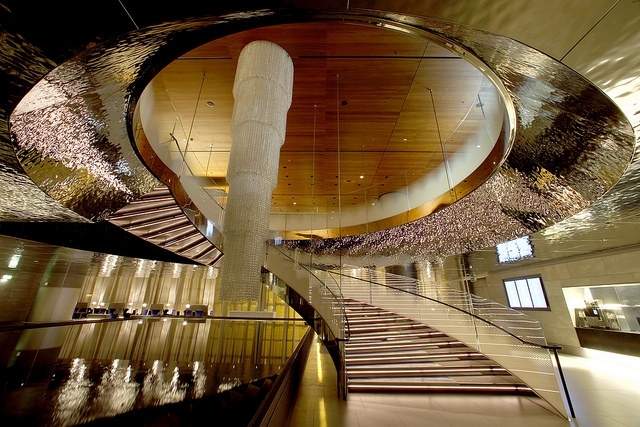 The opulent curved access staircase with hanging designer chandelier was a spectacular entry point. With such elegance, you’d be forgiven for thinking you were heading to a top London eatery. The reality is not quite so glamorous. On arrival I was taken aback at how busy it was. In comparison downstairs was relatively quiet with maybe a third of all seats taken. Here, I couldn’t see a free table to eat at. I wasn’t expecting that at half past midnight! There were some unused chairs about, including at the bar so it wasn’t too bad for me but any families in need of a late evening meal would have to hang around with beady eyes. Pommery champagne was available and a decent selection of spirits including Johnnie Walker Black Label, Absolute vodka and Malibu – everything you need for that impulsive cocktail… I didn’t see the wine list. There were two hot food buffet stations. The dishes to tuck in to were varied, in keeping with catering for a cosmopolitan clientele. This included rosemary chicken, fish cakes, chilli con carne, mie goreng, dum aloo, Provençal asparagus and chicken kabsa. The same two soups, mezze dishes and salad bowls as downstairs were also present. . There was an attractive and considerable array of desserts to indulge in including cupcakes, creme brûlée and various cakes. As you would expect, service was exceptional from all the staff I encountered. They were super polite, efficient and only happy to assist. The lounge was very clean throughout with spotless floors, tables and work surfaces. I rarely saw a left behind glass or plate anywhere. I enjoyed my visit to the Qatar Airways Al Mourjan business class lounge very much and overall consider it the most impressive business lounge I have experienced. Its size is overwhelming at first and I felt I spent much of my time exploring the huge open spaces. I would love to visit again with the benefit of familiarity. Aspects of the design are stunning and this really does have an impact. The effort, time and expense that had clearly gone into building the lounge made it feel like a special experience. Certainly parts of it lacked the warm ambience I found in the Malaysian Airlines Golden Lounge in Kuala Lumpur a few weeks previously. What it lacked in one area, it more than made up for elsewhere whether through the attention to detail of its design, the high standard of cuisine or the consummate professionalism of its staff. If you have the opportunity, I highly recommend a visit. Next, in the final part of this series, I take a look at the Qatar Airways newer – but not newest – business class seat and service on a Boeing 787-9 to London. I agree with most replies, the lounge is pretty underwhelming except for the scale. And with such a size, they could easily add a lot more facilities, variety of areas, etc. They could do a better job of explaining the facilities as well, eg the area with private sleeping rooms and showers is hidden way at the back behind the cafe. Still, it’s a lot better than waiting around in the terminal and worth the long layover for the tier points. Well you can recharge on the plane easily, unlike some other airlines. Just rolling it back a tad, I’ll just mention that if you’re departing Doha in either First or Business you can be dropped off at the dedicated First/Business entrance at Doha airport. Those arriving in Doha on a First or Business class ticket shouldn’t join the queue at the main immigration station. Go through the business lounge on the left (name eludes me) which has it’s own immigration station. Your driver can meet you there. The people who built this lounge built it for travelers with higher ideals than comfort and coziness. It is an ode to globalisation, the age of jet travel, and transience. The other thing I’d say is the QR lounge food offering in London, with an a la carte menu was lovely last week when we were there. Soup for starters, plaice for me, curry for my wife and a nice dessert, washed down with some mocktails (we don’t drink) and we might have snaffled a few Lindt hazelnuts in the cute QR box they provide. Also on our return from HKG the Pier F was equally good, the bruschetta, soup, veal and mushroom voluvant and soft shell crab starters were all great. The lamb shanks mains were ok, but not fantastic and sorbet to finish. We do appreciate our food and to us it does make a difference. I see mixed views on this lounge and strangely enough I can agree with them all . Yas someone has put ,parts of it are soulless and actually too open and vacant , but personally I would much prefer that to a cramped overcrowded confinement area of a lounge which I have encountered before. There was a hint of something missing that could of made the experience better , maybe that can be found in the QR First class lounge , but overall as bizz lounges go it’s certainly different and well worth a visit in my view. Looking forward to the Business QR Dreamliner report , as it was a 787 -9 I went on to Thailand after my stay at the lounge…I would be very surprised if it turns out to be be less then positive as I discovered .. It would have been a 787-8 that you travelled on – the larger 787-9s are yet to be delivered to QR. I was very unimpressed on my two visits. A long wait for a shower on the first, and no chance of one on the second before my flight was called. The food offering is shameful, the seating uncomfortable and the vastness is just showing off. I’d much prefer a dozen extra women’s showers to that oversized pool. So @Helena, other than that you quite liked it, then? I’ve been through the AM lounge a lot, most recently last week. It’s palatial, but really is form over function in many respects. – Nearly all the seats in the lounge LOOK good, but are really not optimal for eating/relaxing. No one in their right mid would oput those big leather armchairs in their dining room for eating off. – Only one spot to get alcohol, and nowhere to really sit other than at the bar. My fantasy is to be able to get a glass of something alcoholic, then sit in a comfortable seat in a quiet area….not possible here. – Food variable. Last week for lunch the options in the restaurant area was very poor. – No sleeping area (fair enough, not many lounges have this), but there a lot of people overnight in this lounge, and the “quiet” area isn’t dark or really good for napping in. Overall, it’s fine, but I certainly no longer go starry eyed at the thought of a layover here. Give me LHR Galleries First any day of the week, with a comfy armchair, and a short walk to a self service bar. Thankfully onboard (especially in the Qsuites) they are totally at the top of the game. I got some Krug by asking for it at the restaurant service counter shortly after it was discontinued from this lounge. It was disappointing as they’d chilled it too much and kind of ruined it. I agree with @Matt about the sterile feel of the Al Mourjan lounge and wouldn’t be in a hurry to revisit it. Full marks to QR for how much money they’ve spent on it and the myriads of helpful staff though. I do feel a little the same way about the QF lounge at T3 LHR too. PS no one’s ever mentioned this but the tobacco in the QR duty free seemed quite low priced. Whilst I enjoy the lounge, I think “soulless” is the right word. The iPads also seem to be a bit of pointless bling. Talking of swimming pools, though, you can pay to use the pool in the airport hotel, inside (above) the terminal. I had a very long layover in Doha once and a swim in the pool and a rest in the hot tub is heavenly between two long-haul flights.